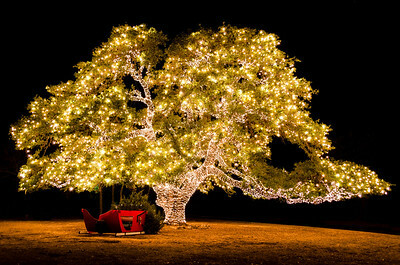 Time for the annual lighting of the largest oak tree in Cedar Park tonight from 6:30 PM - 9 PM. Read more about the event at http://www.cedarparktexas.gov/index.aspx?page=448. An amazing amount of water was spraying on me as I took this shot. I had to wipe off my lens several times to remove the waterspots as I captured this scene. It was a little chilly to go swimming on the day I was there, but some folks were still taking the plunge. Going through the archives today and stumbled upon this shot I made on our Day One hike in 2014. 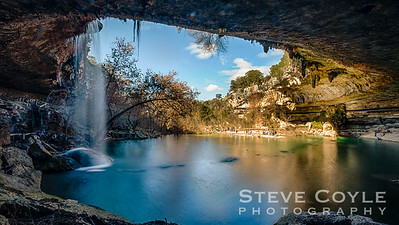 Reminds me that we need to make some time to get back to Hamilton Pool again this year. I imagine the waterfall is running quite well with the rain we've had this winter. I can't help but think of the John Denver song "Country Roads" when I look at this photo. I dug through the files for something Valentine's related and the shape of this tree was about as close as I got. Happy Valentine's Day y'all! Along the Rimrock Trail at Doeskin Ranch, this is one of the few times I've actually seen this stream running in the past few years. Actually had to use the stepping stones to get across without getting my feet wet. Nice to see some water in it again. 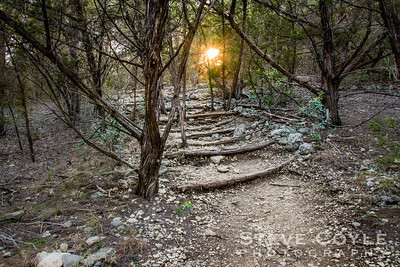 I had hiked past this grove of oak trees in search of a possible place to capture the sunset. At the time it was just a grove of trees. As I was returning to the car after all but giving up on a sunset shot I spotted these two who apparently thought the grove of trees was also a good place to watch the sunset from. Thought it added some nice interests to what otherwise was a not so spectacular sunset. 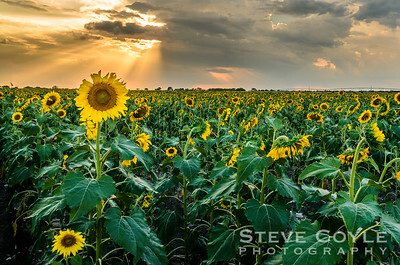 For more on the story of this shot, check out my blog at http://www.stevecoylephotography.com/Blog/Exploring-the-World. Now this is the way I would prefer to start a work week. 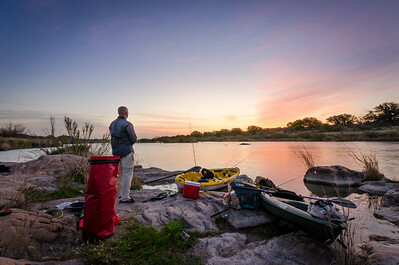 Taking in sunrise with my buddy Phil Crochet on the banks of the Llano River in the Texas Hill Country. 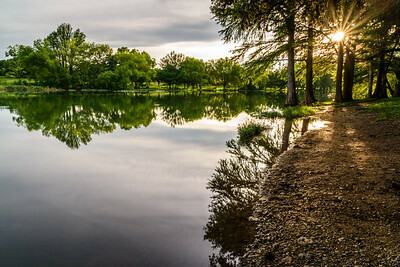 Nothing like a good swimming hole and this one is on the San Gabriel River just off County Road 279 south of Liberty Hill, Texas. I've ridden my bike over the bridge that looks down on this swimming spot more times than I can count over the years, but never stopped to go down and take a look. Yesterday evening I decided to make the stop in my celebration of National Camera Day. 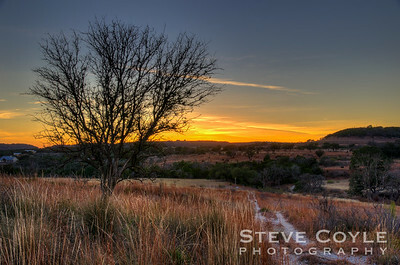 Hope you enjoy this little slice of the Texas Hill Country as much as I enjoyed capturing it at sunset. 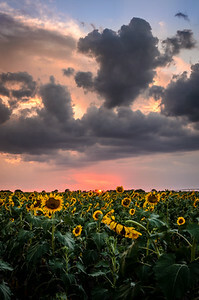 A sunflower field in Medina County east of Hondo, Texas. 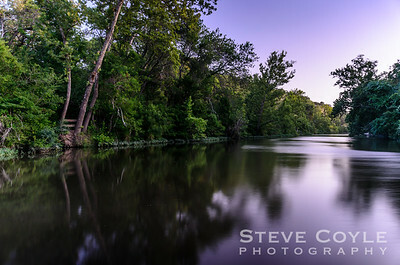 For more on this photo, check out my blog at http://www.stevecoylephotography.com/Blog/Exploring-the-World. 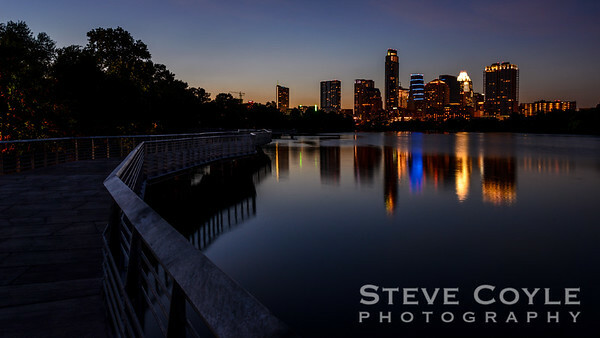 On the Lady Bird Lake Boardwalk in Austin, Texas during the blue hour. 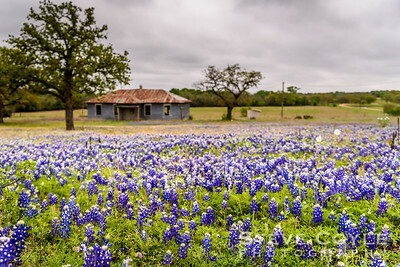 When I see scenes like this I know why the German immigrants that moved to the Texas Hill Country found it so inviting. Views like this are why I love living close to this area of the country. It's not mountain majesty, but the hills have their own special beauty that can infect ones soul. 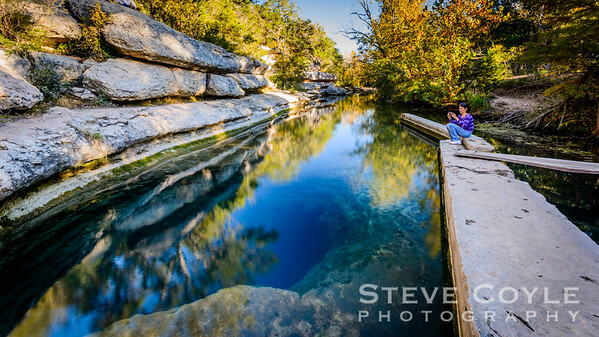 I went on a photo walk to Jacob's Well in Wimberley, Texas last weekend. I've lived in Austin almost 20 years now and this was my first trip there. Hard for me to believe that. It was almost golden hour when I shot this and I only was able to get this one shot before a large group showed up making it precarious to try to take photos without getting knocked off this little walkway. Plus it didn't help matters when they started throwing rocks into the water ruining the flat mirrorlike surface. 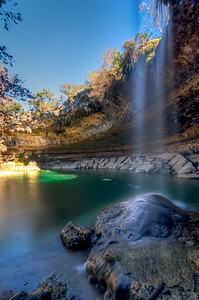 Wish I had a little more time to dial in my polarizer to get rid of some of the reflection that's preventing you from seeing a lot of the hole that is 'Jacob's Well'. Scuba divers regularly dive here exploring the underwater passages. I scuba dive, but I don't think I'd have the nerve to try and find my way around down there. Sunset on Blue Hole in Wimberley, Texas. We stopped by Blue Hole on our outing yesterday afternoon right as the sun was setting. There was some color change in the cypress along the bank, but I'm guessing we still have a week or two before they really put on a lot of red color. 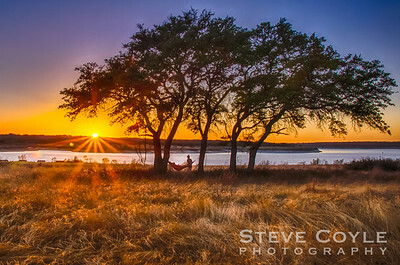 Still one of the prettiest places I know in the Texas Hill Country to watch sunset and reflect on the day. It was an overcast, cold, misty November day when we visited Selah - Bamberger Ranch Preserve yesterday for a hike of the ranch to take in the fall colors. I made this shot above one of the ponds on the ranch. Their dog was leading our group and appears to be asking 'Are y'all coming?' 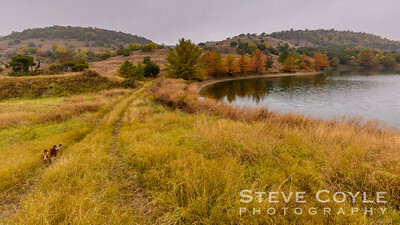 This is a beautiful piece of the Texas Hill Country, even on a misty day. 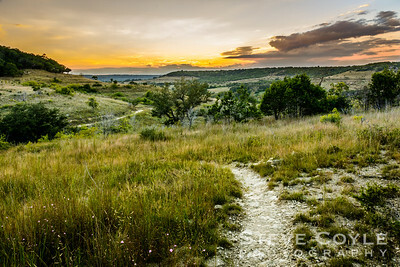 One of my favorite hills in the Texas Hill Country. 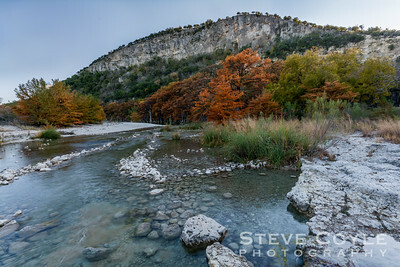 I have climbed Old Baldy at Garner State Park more times than I can count for views of the valley cut by the Frio River. 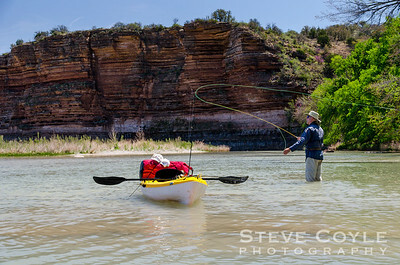 I have swam beneath it's shadow in the chilly Frio River on many a warm day. I never tire of seeing it and always welcome it's sight whenever I visit this special place. Sure wish I could go there today, but unfortunately I will have to settle to live that adventure through this photo today. Every holiday season Blanco County lights up their courthouse. 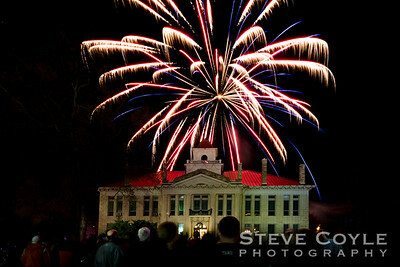 On the night they light the courthouse they have a big fireworks display right before they throw the switch. We were lucky enough to find out about the celebration the weekend before so we made plans to be there on Friday night for the festivities. We were not disappointed and the weather was much better than when we went there last December during one of the Poler Vortexes. 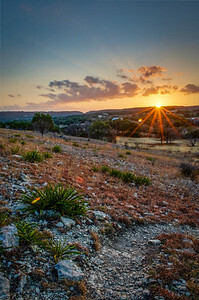 If you ever find yourself in the Texas Hill Country on Black Friday, Johnson City is a great place to see fireworks, a LOT of Christmas lights and hear some live music..
Another day comes to an end on the cedar covered hills of the Wild Basin Wilderness Preserve in Austin, Texas. I made this shot as I was heading back to the parking lot. I had rounded the corner and was struck with how cool the scene looked with the light streaming through the trees down the trail. It felt like I was ascending into the light on a late winter afternoon. I passed this scene on a little detour I took on the way home Sunday. I had walk through a ditch filled with weeds (glad I didn't encounter any snakes) and wedge my camera lens through the openings in the fence to get this shot, but I really felt I needed to capture the scene. Too bad this home has been abandoned. 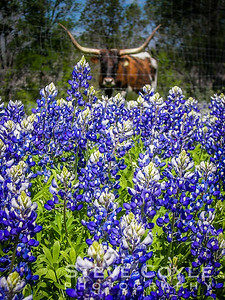 What a great view they had in the spring with all those bluebonnets in their front yard. I can't help but wonder what happened to the people that once lived here and why hasn't anyone kept up this place? We went on a drive this weekend to check out the effect of the rain we received on different Texas Hill Country rivers and creeks. We are glad to report every one we saw was running now. Something we hadn't seen in years. 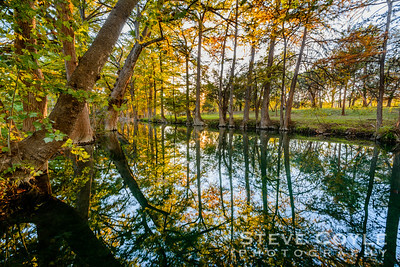 We stopped for dinner in Utopia at the Lost Maples Cafe, then ventured over to the Utopia Park to check out the Sabinal River. When we last saw this part of the river it was about 6 feet lower than it is now and what water was in it was stagnant and not very inviting. The rains have refilled the river and it is once again flowing over the little dam behind me. The river has returned to the swimming hole I remember from my youth. I didn't take a dip this evening, but sure would like to return someday to do just that. 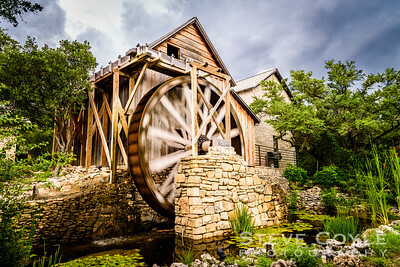 A storm was brewing over Lake Travis when we visited Anderson Mill on Sunday. This is a replica of the original mill built in the 1860s by Thomas Anderson on Cypress Creek. 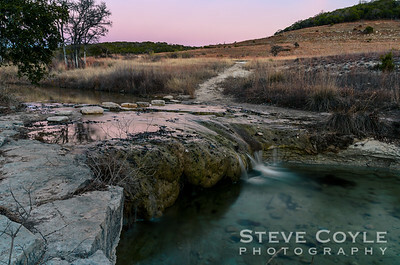 Until the recent rains, you could actually see the original mill site in the dry lake bed a short way from the site of this mill, but once again it is submerged beneath the waters of Lake Travis. This grist mill is fully functioning, although they were not grinding any corn whne we were there. The Anderson Mill Garden Club opens the grist mill to the public once a month from March through October. You can find their website and schedule at http://www.volente.org/amgc/.